In the construction of a wooden house, at a certain point, it becomes necessary to choose an inter-heater insulation. 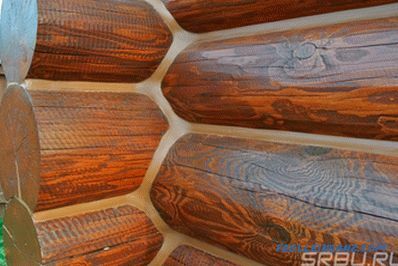 In this article we will figure out which mezhventsovy insulation to choose for a bar or log, what materials are suitable for this, and what should be discarded. 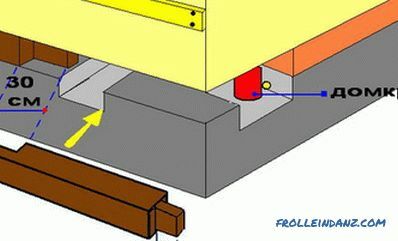 The main task, which requires a seal between the flanges of the log house, is to eliminate heat loss through the cracks. 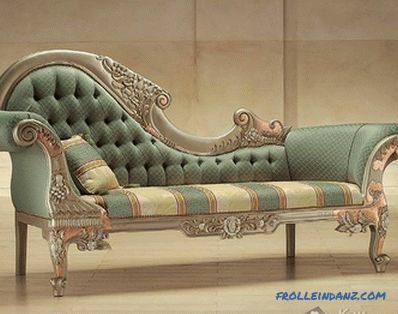 In addition, you should consider the features of a chopped house, first of all, the mobility of the crowns. Even after shrinkage, they do not remain completely static due to the fact that wood tends to "play" with changes in humidity. From this, the gaps change a little. 1. Sufficient density. Loose material cannot interfere with the flow of air through it. 2. Low thermal conductivity. High resistance to heat transfer of the material is achieved at a certain density, at which the air in it occupies a sufficiently large volume, but the appearance of a noticeable flow is impossible. Thermal conductivity of insulation should be at such a level that during the cold season there are no cold bridges. 3. Elasticity. Elasticity is necessary to compensate for seasonal variations in the size of a bar or log. The material should compress easily and restore its volume again, preventing the appearance of cracks. 4. Interaction with water. The compactor is located at a temperature and humidity differential that creates conditions for condensate to form. A good mezhventsovy insulation should release moisture into the atmosphere, and not accumulate it inside. It must have good vapor permeability and not interfere with the flow of this process in the wood. 5. Durability and resistance to decay. Insulation should not lose its useful qualities during the entire service life. 6. Environmental friendliness. 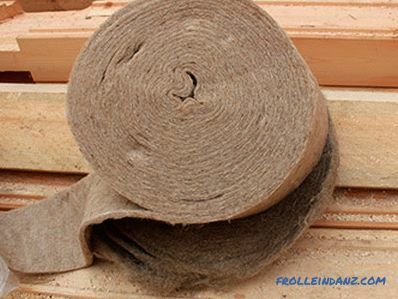 Insulation should be an environmentally friendly material. It should not release volatile substances and cause allergic reactions. 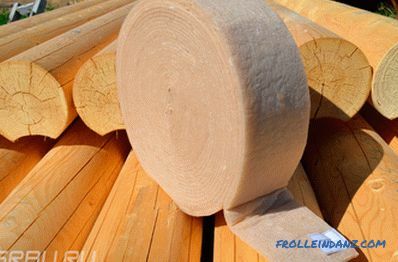 We define the classification of insulation for timber according to several parameters. Each type has a set of advantages and disadvantages that must be considered when choosing a material. Let's review, starting with traditional materials. Based on the above requirements, we can conclude that natural materials are the best materials for inter-crown warming of a log or bar. There are two types of flax heat insulation materials suitable for mezhventsovogo insulation - this is linen tow and felt. A tow is a coarse fibrous waste from the primary processing of bast plants. Due to the homogeneity of the fibers, it is easy to level and get rid of knots. But most often, tow is used for the final caulks of the intervening seams. Linen felt is used as the base material. 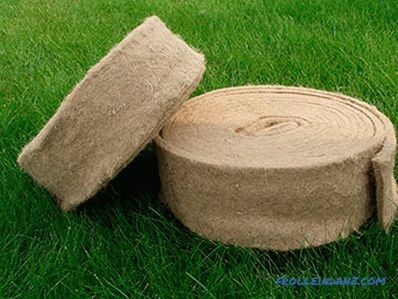 Linen felt is a nonwoven fabric based on flax fiber. His other names are Eurolyn, lnovatin. In fact, felt and lnovatin are different materials. Felt is made by needle-piercing technology, its threads are randomly woven through the thickness of the layer with special needles. Wadding is fastened through the firmware of the canvas with cotton or synthetic thread. For mezhventsovy seal usually use needle-punched material. Linen felt is used in the form of tapes 5–20 mm thick and up to 150 mm wide. The thickness and width of the tape is selected depending on the width and profile of the beam. Linen felt has a density of about 700 g / m 2 , the fiber contains: 80% cellulose, 5% lignin, 3% pectin and wax. Due to the presence of lignin, it is able to breathe and give away excess moisture. Flax compactor does not accumulate a large amount of moisture even with prolonged exposure to moist air. 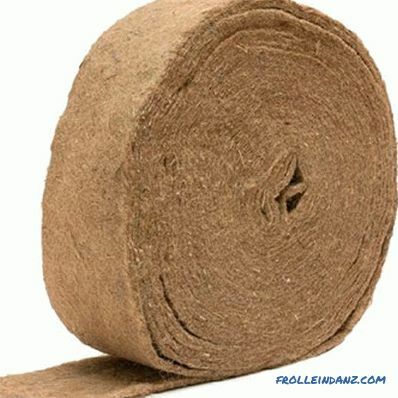 Jute felted tape is similar to linen, and is used in the same way. 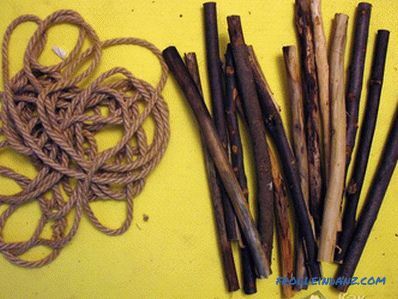 Jute has a higher resistance to decay, they are less interested in birds. 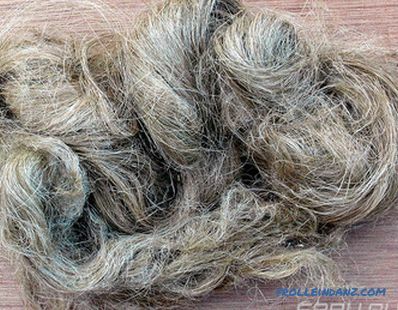 But it is stiffer than flax, worse than being crushed, which must be taken into account when working.Jute fibers contain: 70% cellulose, 13% lignin, 0.2% pectin and 0.4% wax. 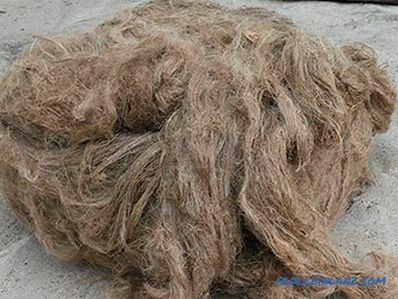 Of the negative characteristics, it should be noted that jute is more brittle and hygroscopic. In addition, because of its foreign origin, this material is more expensive. 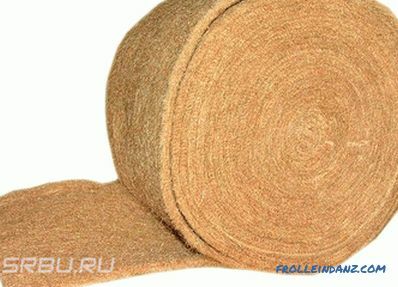 From 30 to 50% flax fiber is added to the jute to improve the properties of the tape. So get jute-flax wyolok. In this case, the insulation combines the advantages of both materials. In order to improve the quality and durability of non-woven tape insulation, during production lignin is added to them and antiseptic and flame retardant treatment is carried out. Lignin is a natural polymer derived from wood. It serves as an adhesive for bonding fibers. Treatment with antiseptics and flame retardants compensates for the natural disadvantages of natural fibers. 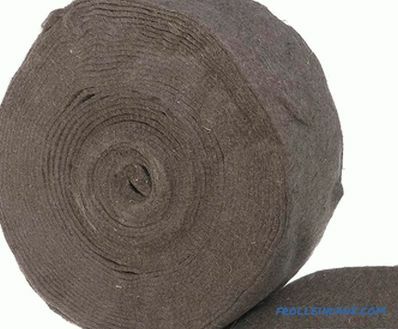 Compactors in the form of a twisted cord of jute fiber are used for sealing joints from the inside after construction. With their help, the joints are given a finished look, wood defects are masked, which are especially visible at the edges of the crowns. The caulk with a cord performs a mostly aesthetic function. 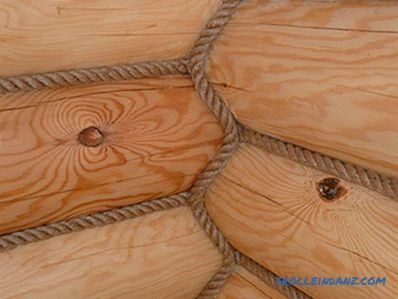 For log log houses it is not used due to narrow joints. 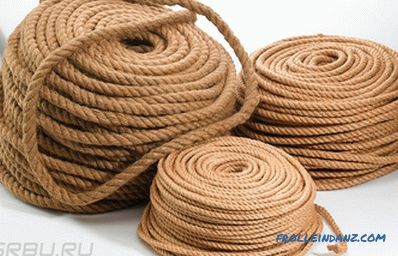 Jute cord for decorating inter-event joints. This is the oldest material used for sealing joints. Thin threads of moss create a dense, air-saturated mass with low thermal conductivity. Moss is valued for its ability to absorb and release moisture. In addition, it has antiseptic properties and has little to rot. Currently, this material is not used because there are a number of seals that exceed moss in their characteristics. Moreover, the process of collecting and harvesting moss is very time consuming. It is very difficult to distribute it evenly, and when fully dried, the moss becomes fragile, so it can only be used in dried form. Previously, moss was indeed widely used for sealing joints, but this was only because there were no other materials. There are a number of materials intended for mezhventsovogo insulation, in respect of which are constantly debating about the suitability of their use for these purposes. Mostly these are synthetic materials of various kinds. Compared with natural materials, they have both advantages and disadvantages. 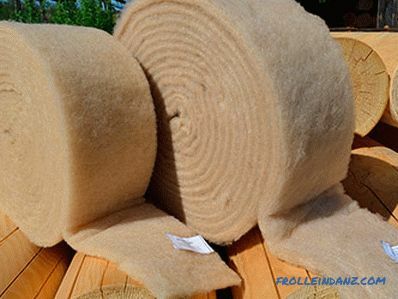 Synthetic felt, which is made of polyester fibers (polyester), can be used for inter-coat insulation. elasticity, eliminating the appearance of gaps in the process of operation. If we leave aside the question of the environmental friendliness of polyester, there remains one drawback - low hygroscopicity. The likelihood of condensation in it is higher than in natural materials. Before its use, it is necessary to accurately assess the temperature and humidity conditions of the room and climate features. May require vapor barrier joints from inside the house. Sealant made of synthetic fibers. This material was designed to seal installation seams when installing windows, and has interesting properties. Thermal conductivity is 50% higher than that of fibrous insulators. Vapor permeability is 15% lower than that of felts. Does not absorb water: water absorption - 4% (measured after 12 hours of exposure under water). Waterproof: the tape does not pass water under pressure from 200 to 600 Pa, depending on the brand and manufacturer. 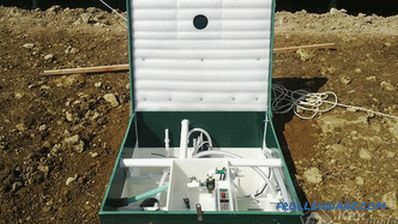 At 20 o C, after installation, it expands within 15-30 minutes 5 times, filling all irregularities. When the thickness of the seam fluctuates, it changes its volume, leaving no gaps. Easy to install due to adhesive layer. Service life - at least 20 years. The comparison given at the beginning of the list with fibrous materials is conditional, since the real parameters of both felt and PSUL depend on the degree of compression. 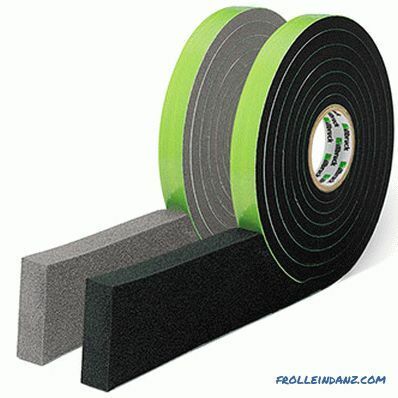 The pre-compressed sealing tape can be used both as the main insulation and as an additional insulation - on the outer side of the joint. The external seal reliably protects the joint from water, but does not prevent the discharge of water vapor to the outside. The tape during operation does not require renewal and additional caulk joints. 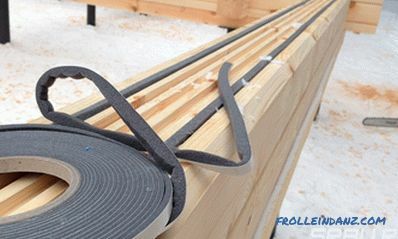 Despite its merits, foam tapes are rarely mentioned in the list of materials for the construction of a log house. Apparently, their use does not correspond to the philosophy of wooden construction. This material in its thermal insulation qualities surpasses insulants from plant fibers. It is easily crushed and after removal of the load it restores the shape. It has high vapor permeability, it is able to accumulate and easily release moisture. Does not shrink over time. The biological resistance of wool insulation is provided by antiseptic. Among the shortcomings, it is necessary to note the high cost and allergenicity. This class includes special pastes that fill the joint and harden in it, creating an insulating layer. 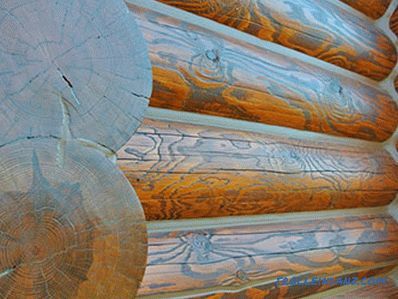 For log cabins use special sealants with sufficient elasticity. As a rule, sealants are applied from the inside. They not only seal the gap, but also make out the joints. Most of them are easily painted, and some already have a certain shade that can be matched to the interior. Seal the joints with sealant. When using synthetic materials and sealants, it is better to consult a specialist. Unsuccessful selection or the wrong combination in a few years can spoil the house. What kind of insulation materials should not be used as an inter-ring seal? 7 cord or in the form of sealant. 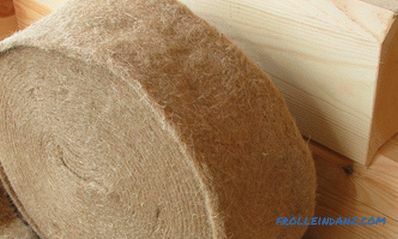 Mineral wool easily condenses moisture on its fibers. As a result of this, it sags, and the joint may become blown. In addition, regular wetting of the joint will lead to rotting of the wood in a place inaccessible for processing. Polyurethane foam does not have sufficient elasticity. With prolonged compression, irreversible deformation occurs, and as the joint expands, a through-gap forms in it. 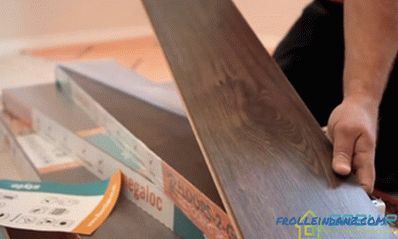 Polyurethane foam sealant is even less elastic, and when filling joints there is a risk that expanding foam will raise the rims and disrupt the correct operation of the log locks. When choosing a mezhventsovogo insulation it is necessary to accurately consider all the features of construction, starting with the appointment of the house and ending with the quality of the basic material. Do not neglect the consultation with experts in this field.